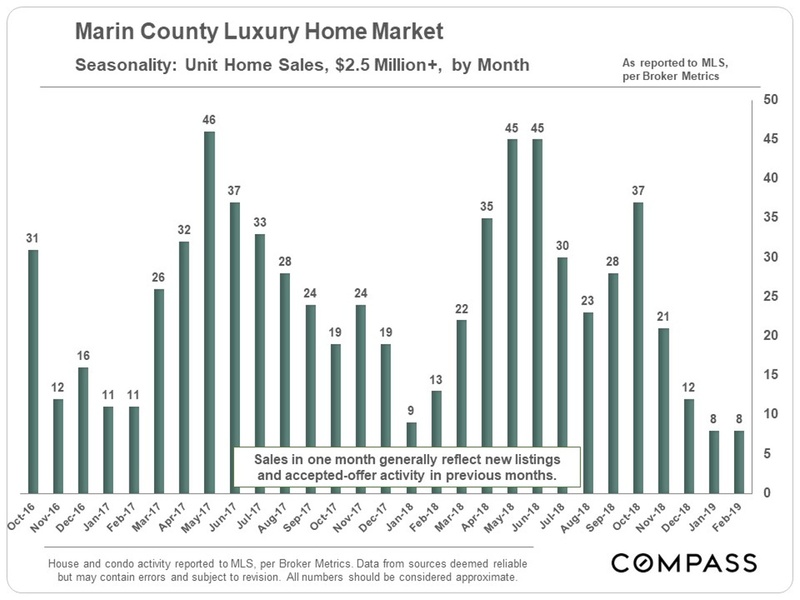 Spring 2018 was one of the hottest markets in the Bay Area over the last 2 decades. Then the market began to cool in summer and autumn – demand, sales and appreciation rates generally dropping, while supply and price reductions increased – before the mid-winter doldrums took hold. 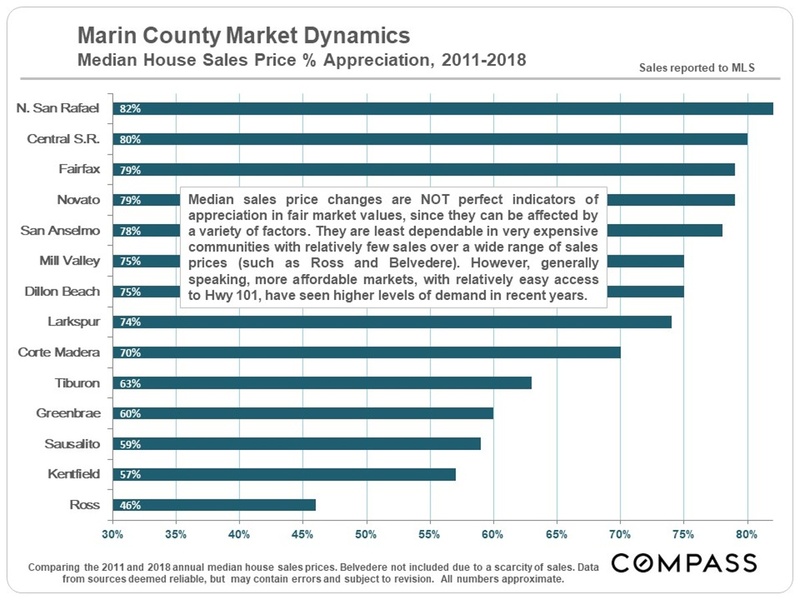 The magnitude of these changes varied by region, and Marin was not as affected as much as some other counties. 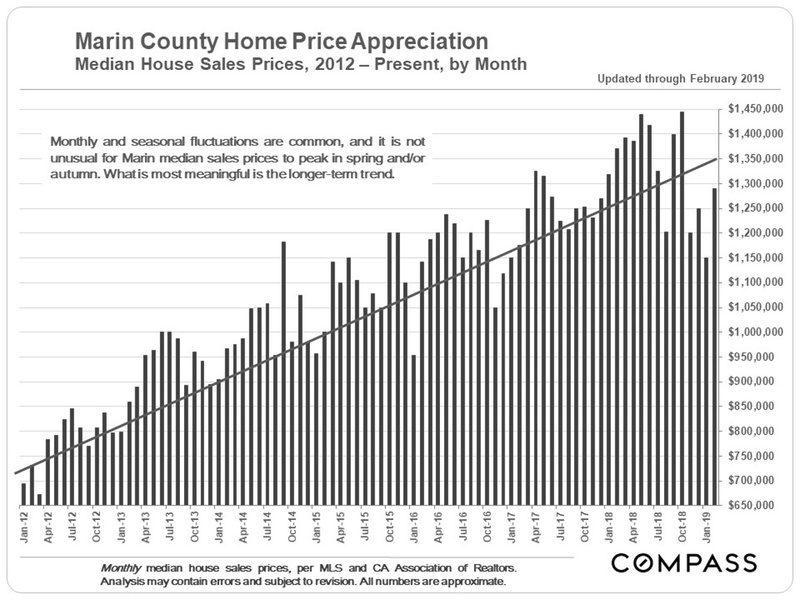 Since the recovery began in 2012, spring has typically been the most active season of the year, and often the period during which appreciation gains have been the largest. 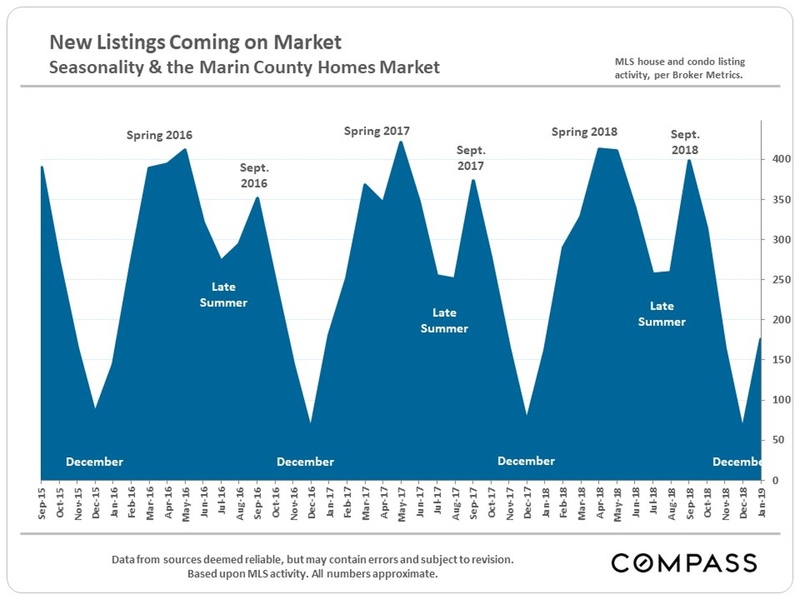 The spring 2019 market is just getting started amid a diverse set of economic indicators. Financial markets have, so far, recovered in 2019, interest rates have dropped, and big IPOs loom. We will know much more very soon. Markets appreciate due to a wide variety of local and macro-economic reasons: economic cycles, industry booms, inflation, consumer confidence, interest rates, hiring, gentrification, new construction, comparative affordability, ecological factors, population migration, buyers’ median age, commuting, fashion, and so forth. The particular combination of factors affecting any particular region is often specific to that market. 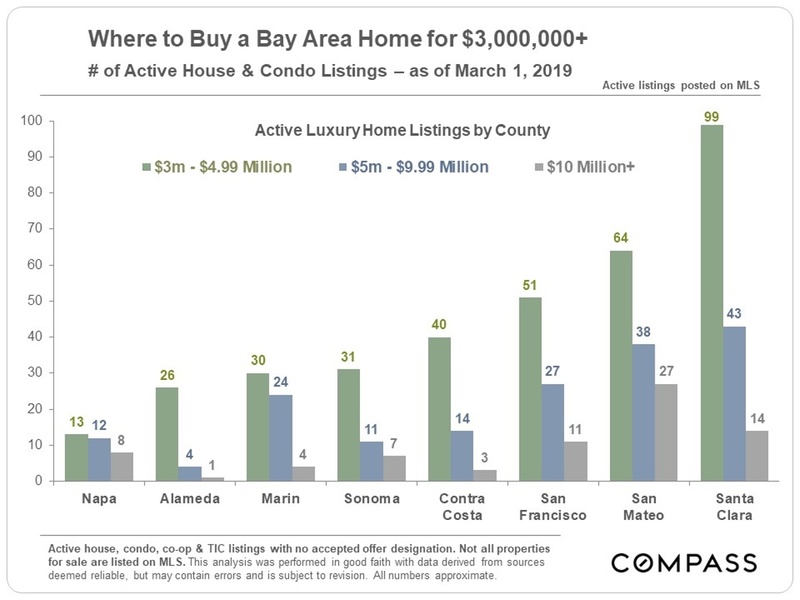 Around the Bay Area, more expensive homes have generally appreciated less than more affordable homes, especially over the last 3-4 years. On the other hand, during the last downturn after 2008, the prices of more expensive homes usually declined significantly less. These appreciation percentages should be considered very approximate. 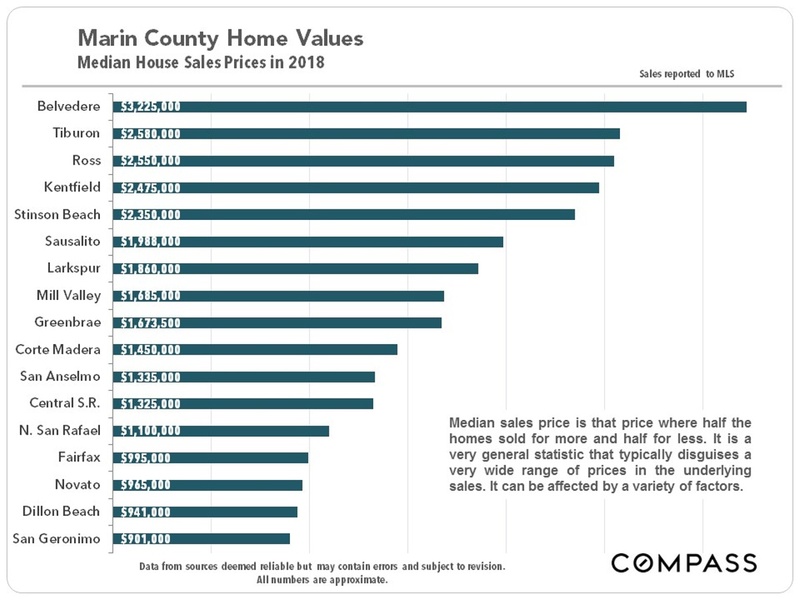 For more context on the appreciation percentages above, below is a chart from last month’s report delineating 2018 median home prices by city. February-March is usually the time of the year when new listings start to pour onto the market, fueling the spring selling season. 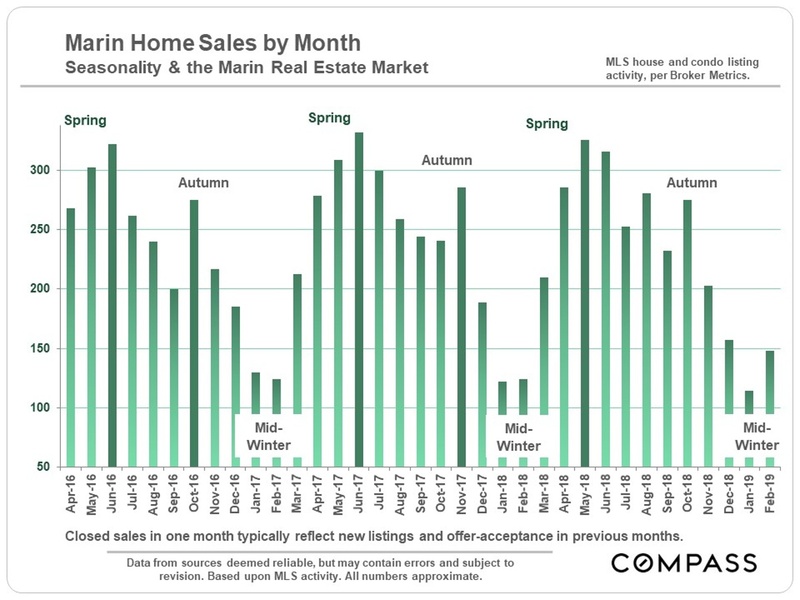 March is typically the month in which the spring surge in sales begins to show up – following the uptick in new listings. If anything, the luxury market is even more fiercely seasonal than the general market. 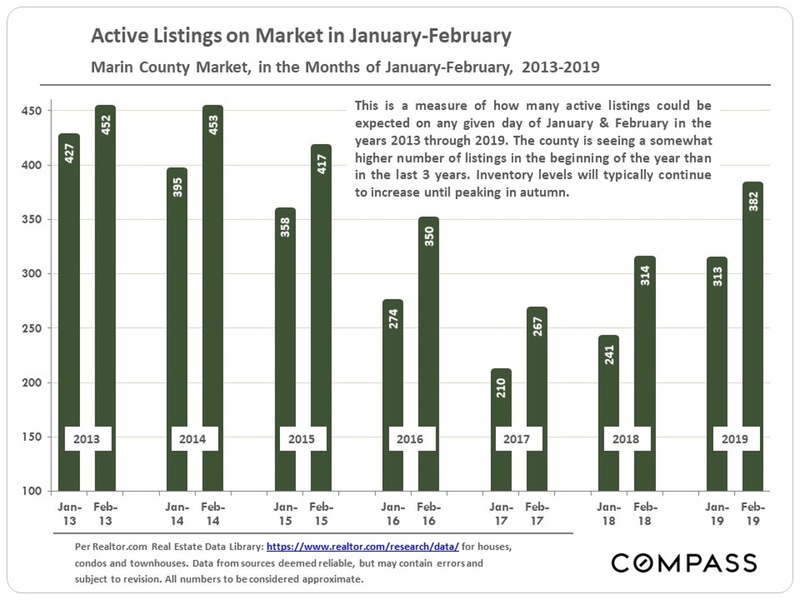 The number of active listings in January-February 2019 is well up from levels during the same periods in 2017 and 2018, when inventory levels were abnormally low. They are not particularly high from a historical perspective. The number of active listings fluctuates daily, and the numbers below are increasing as more new listings come on market. 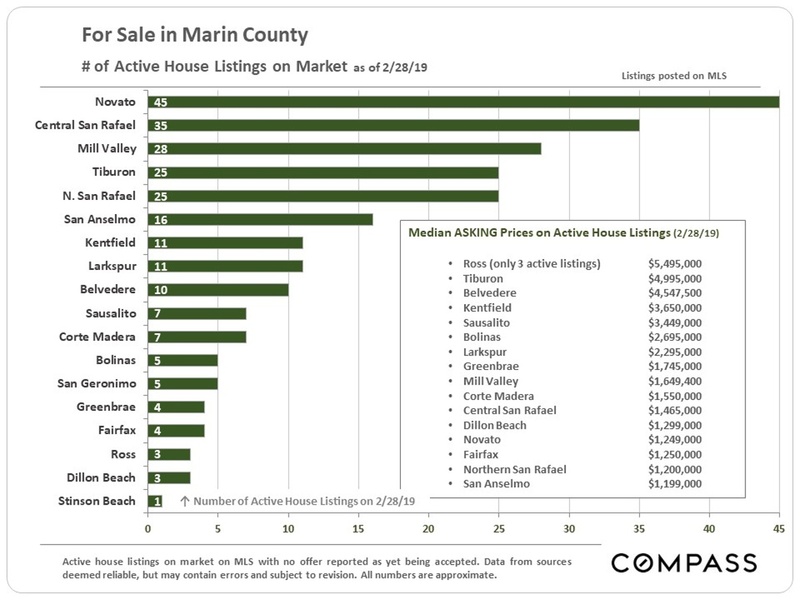 These next 2 charts are snapshots of active listings on the market on February 28th and March 1st. 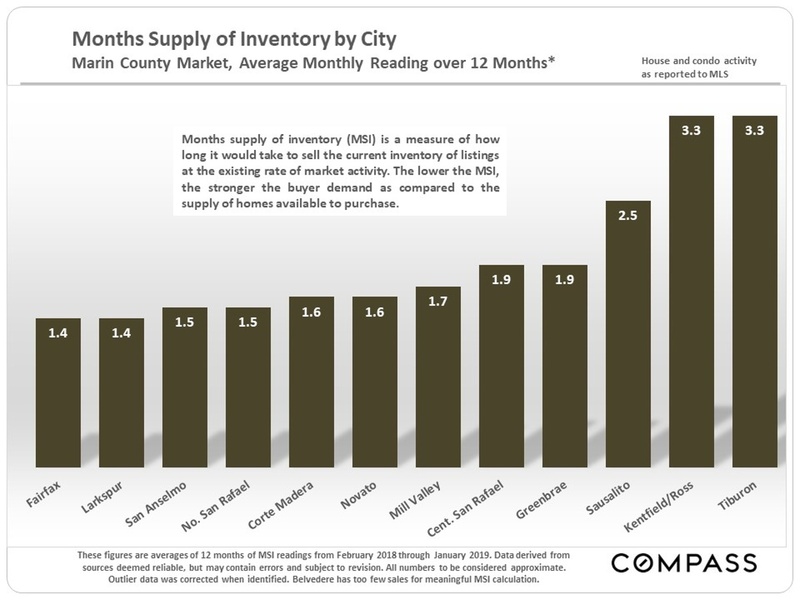 The supply of listings available to purchase varies widely between cities, which can be a simple reflection of market size and/or an indicator of supply and demand dynamics. 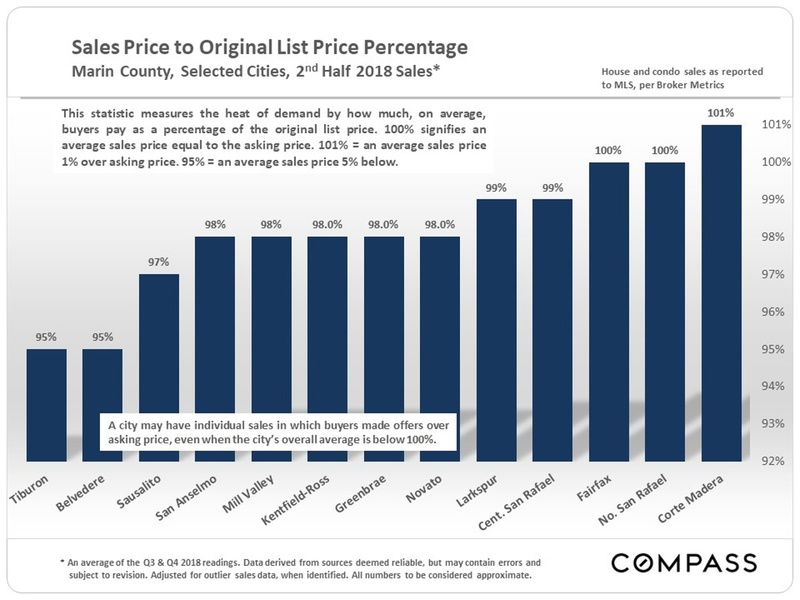 If median LIST prices (below) are well above median SALES prices (charted earlier in this report), it is typically a sign that the balance in listings for sale is disproportionately weighted towards higher priced properties, where demand is softer – and/or a sign of systemic overpricing beyond what buyers consider fair market value. 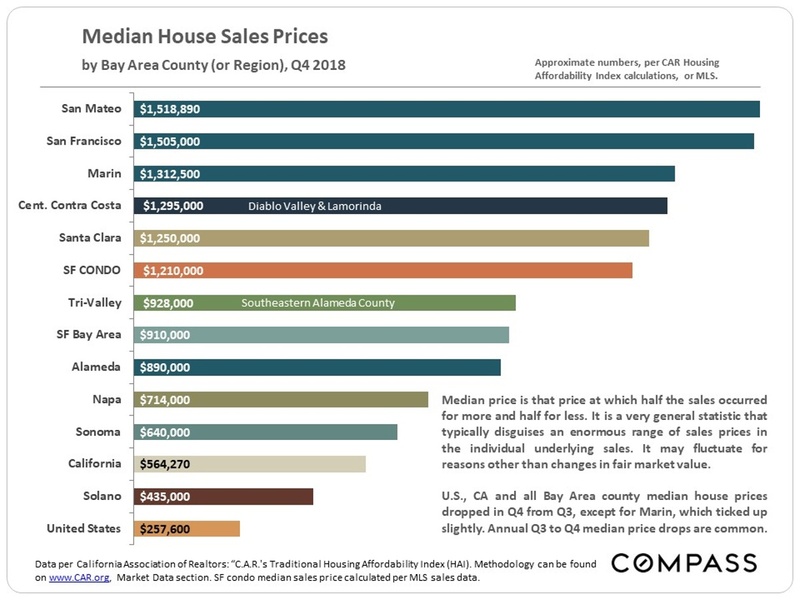 Around the Bay Area, higher-priced communities have generally had somewhat cooler markets than more affordable markets in recent years, which is reflected in the next two charts. But home price is certainly not the only factor at play, which is why the scale doesn’t simply run from low to high price areas. 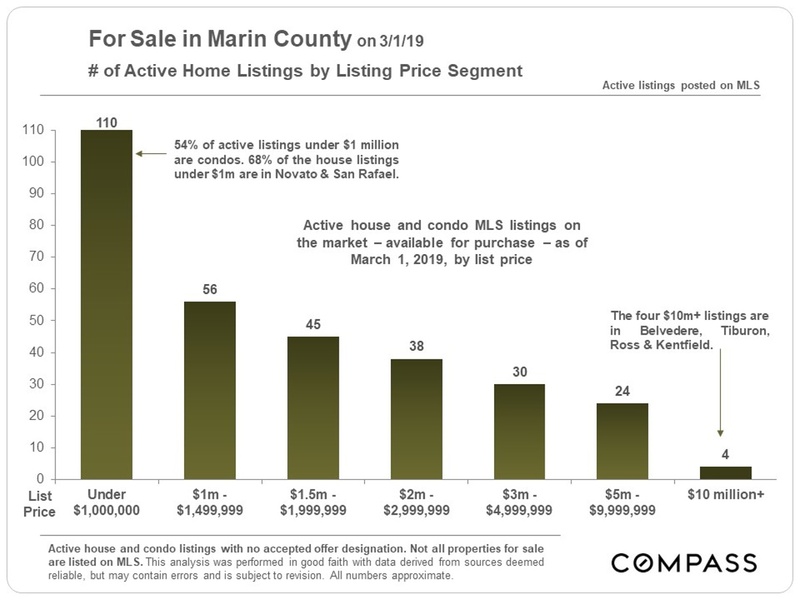 Marin is a very affluent county with a very active luxury home market, but Marin has a much lower population than any county except Napa, and sales volumes are often lower. 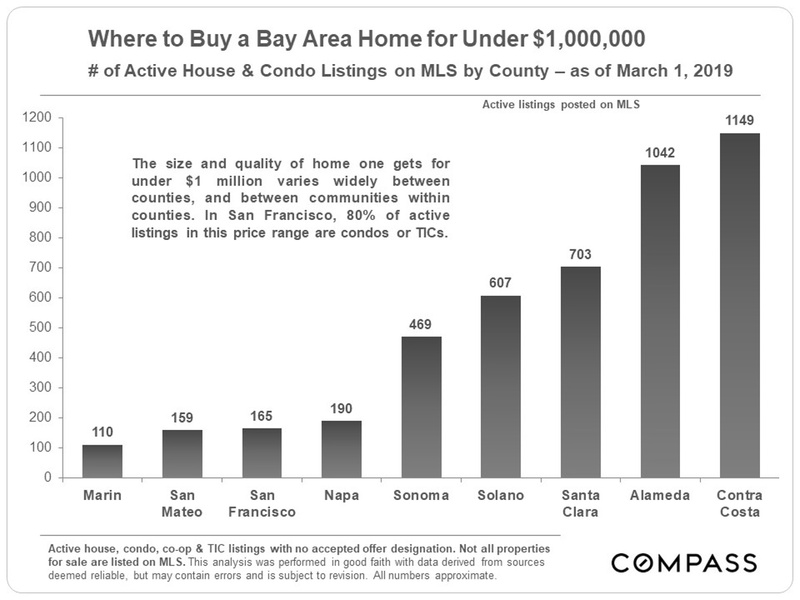 People move to the Bay Area from all over, and people leave Bay Area counties to move to a vast number of locations, for differing reasons. 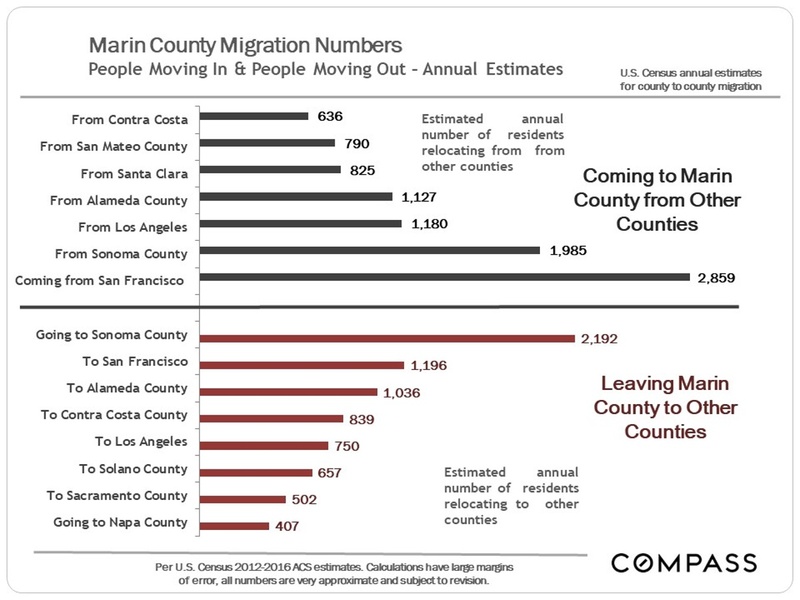 This analysis looks at those counties with the greatest number of people coming and going. In many cases, there is a large exchange between 2 counties, with residents going in both directions – for example, as occurs between Marin and Sonoma. Often, but not always, the outward flow is greater to counties with more affordable home prices, but there are many dynamics at play. 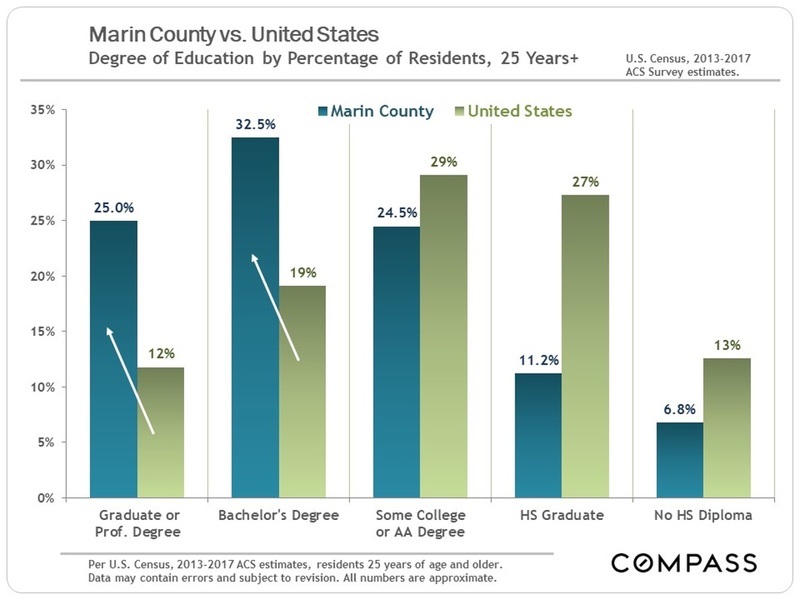 Demographic Snapshot Educational Attainment Marin vs. U.S.
Marin is one of the most highly educated counties in the country, which ties in with its high level of affluence. An indicator of the income-generating value of education, along with an unhappy indicator of where progress remains to be made in income equality. 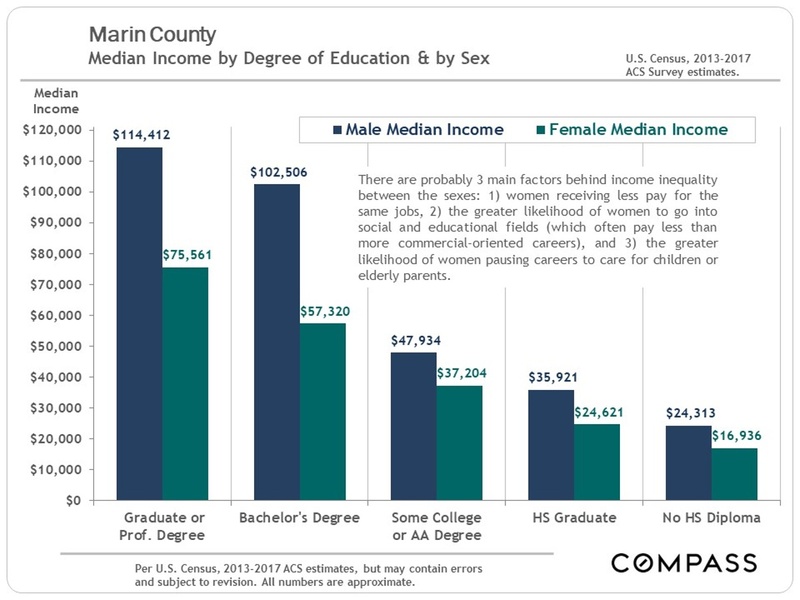 (As an aside, real estate is certainly one of the first, major professions that saw income equality established between the sexes: Women have been holding their own and, indeed, sometimes dominating rankings of top Bay Area agents for many decades.) The statistics in this report are very general and approximate indicators based upon listing and sales data pertaining to assortments, of varying size, of relatively unique homes across a broad spectrum of locations and qualities. 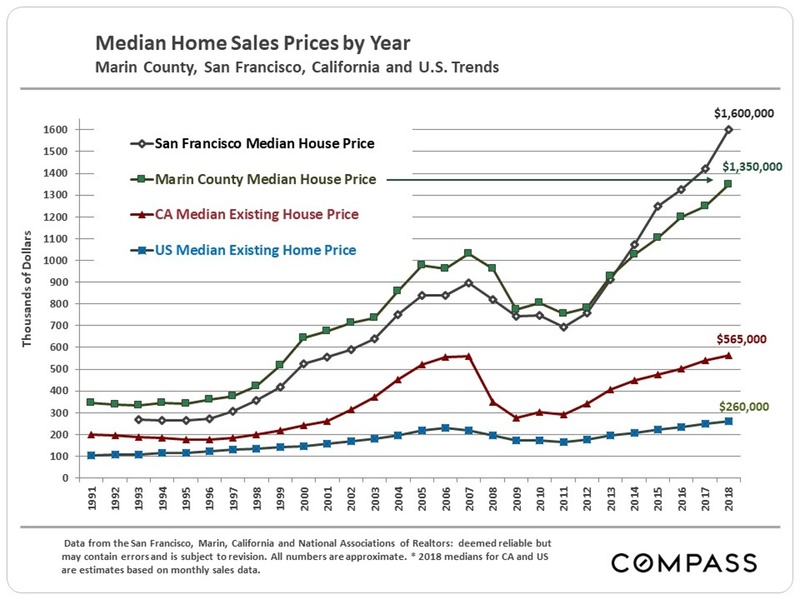 How these statistics apply to the current value, appreciation trend, and prevailing market conditions of any particular property is unknown without a specific comparative market analysis.